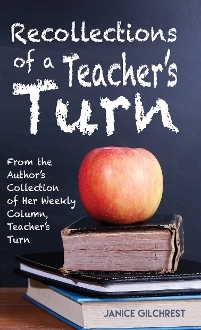 Janice Gilchrest’s column, Teacher’s Turn, appeared weekly in The Ledger newspaper of Lakeland, Florida, for seven years. Initial perspectives reflected the kindergarten classroom, but later her district role provided insight from elementary through secondary levels. The essays downplay instructional jargon, presenting the reality of the classroom environment, characteristics of child development, and slices of family life. Although a selection of columns from the ’80s comprises Recollections of a Teacher’s Turn, the edited essays ring true today. Gilchrest’s career continued long after her column ended. Her second time around the classroom (1999–2010) reignited her passion for teaching. During this time, she rediscovered her columns in a scrapbook compiled years earlier by her mother. Now retired, Gilchrest’s recollections rekindle sparks of a lifelong fire for teaching and learning, stoked by the joy of living and loving. Who might enjoy this book? : Lovers of life who look to the good and find it in everyday experiences; Retired educators who will smile as they recall life in the classroom; Present-day teachers who are in the thick of the adventures of teaching and learning; Future educators who can only imagine what lies ahead; Parents and grandparents of today’s students who seek direction to keep on keeping on; Faculty or parent groups who use the essays as conversation starters, benefitting from insight and reflection, while brainstorming application for present day.